Vic sailed from Denmark, back down through the North Sea, the English Channel, and the Bay of Biscay, and down the Iberian Peninsula to Lisbon, Portugal. The ship passed through the Strait of Gibraltar again and sailed on to La Spezia and then Trieste, Italy. I don't have any trinkets from these three ports so they must have been mugs. 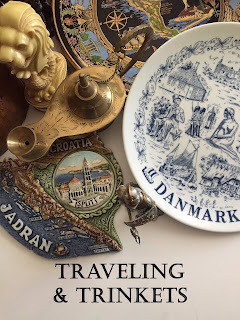 In the first installment of Traveling & Trinkets, I said I would address mugs later. Now seems a good time. Vic came home with a LOT of mugs from this deployment - probably at least half a dozen, closer to a dozen. He thought they were great souvenirs, but when I turned them upside down and saw Made in China stamped on the bottom, I had to disagree. Off to the future garage sale box they went. Only two mugs were granted a reprieve - the one featured last week from Denmark and this week's from Corfu, Greece. Vic picked up this plate and mug set and these are really beautiful (and made in Greece by Dagounis Ceramics). Definitely keepers. Corfu is spelled Corfou and it appears the two names are interchangeable. It doesn't appear that Corfou is Greek, as I've found Kerkyra listed as the Greek name for Corfu. If anyone can clarify Corfu vs. Corfou, please leave a comment. That's it for the souvenirs from this first deployment as the trinkets from Villefranche-sur-Mer, France; Naples, Italy, and Palermo, Sicily were...you guessed it, Made in China mugs!